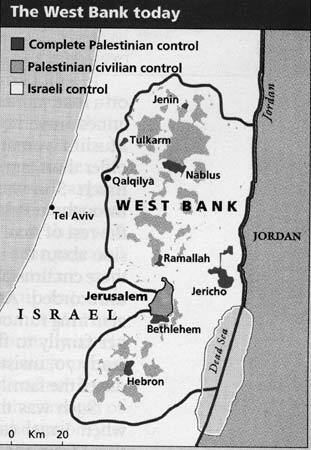 NEWS BRIEF: "Sharon unveils buffer-zone plan", by Gil Hoffman, The Jerusalem Post, 2/22/2002. "JERUSALEM (February 22) - Prime Minister Ariel Sharon unveiled a plan last night to establish buffer zones to achieve what he called 'a security separation' from the Palestinians. In a televised speech, Sharon said the security cabinet had approved the plan Wednesday and promised it would enhance the security of all Israelis, no matter where they live. He said the IDF would begin marking the zones immediately and placing obstacles along them." If a person has not been reading Cutting Edge Ministries for a number of years, they might just skip right past this news story without a further glance. For those people who have not read the articles relating to the build-up of events that will fulfill the prophecy of Obadiah 15-18 concerning the 100% annihilation of the Palestinians, let us quickly bring you up to speed. In NEWS1406 "The Battle Over Jerusalem Has Begun -- Arab Activist", and in NEWS1411, "Palestinian Leader Arafat Must Now Go To War", and NEWS1422, "The Coming Prophesied Annihilation of the Palestinians -- House of Esau", we detail the prophetic reality that God has foretold an End of the Age 100% annihilation of the House of Esau [Palestinians] at the hands of Israel. Right now, Israel has exactly the weapons needed to carry out this type of annihilation, and exactly as prophesied in Obadiah. Further, the House of Esau to be annihilated according to Obadiah 15-18 are the Palestinians of today. But, annihilating an entire population -- man, woman, child -- is a shocking act. In fact, it is so shocking that a nation contemplating it must first thoroughly prepare the peoples of the world, and the international community, to accept such a draconian measure! A very long time of discrediting the targeted people must occur so that when they are annihilated, the average citizen from nations around the globe will simply shrug their shoulders and say, "They had it coming". In my opinion, this gradual preparation of the peoples of the world is exactly the goal of the Oslo "Peace" Accords. Sane, normal people throughout the world have been simply inundated with the scenes of bloodshed and terror of innocent men, women and children. Further, these continuous terror attacks have occurred even though the Israeli government has offered Arafat nearly everything for which he was asking. Seemingly, the more the Israelis gave Arafat, the more he unleashed the terrorists upon innocent people. The peoples of the world have been mightily prepared by Oslo Peace Accords to believe that the Palestinians "have it coming". When I viewed this situation several years ago, as I could see the very gradual movement toward this current position, I thought back to my training in U.S. Army Intelligence. Western governments generally, and Israel particularly, would never carry out a complete annihilation of an enemy population if any of their own citizens were residing within the targeted towns. Therefore, just before an annihilation would occur, the Israeli Defense Force would have to physically separate their own people from the Palestinians. Thus, when the attack commenced, only Palestinians would be in the "target zone", i.e., cities and towns. All Jews would be kept away from harm. To put this situation another way, when you see such a physical separation occurring, you must take this as a definite sign that the annihilation is about to occur. Since I was very sure that no American news source would report such an occurrence, I subscribed to several Jewish news organizations, and receive their news, either electronically or in newspaper delivered to my home. Monday, Nov. 6, 2000 / Cheshvan 8, 5761. "... to create large Palestinian blocs that have no Jewish presence! Thus, I was totally shocked when I received this information from Arutz-7. This could mean war! This development could mean that the annihilation of the Palestinians draws ever closer. Note that this story broke in November, 2000. In the past 16 months, the IDF has been building ever stronger and more sophisticated fences and anti-tank trenches around the Palestinian cities and towns, so that, at a moment's notice, Palestinians could be locked inside, and Jewish citizens kept out. As you can see from these maps, the Arab presence today is far different than in 1947, In 1947, the Arabs were diffused in a strip of land running north and south in the middle of Israel. They had their own territory and their settlements were diffused throughout that territory. But, today, the Palestinians do not have their own contiguous territory; they are clustered into enclaves, i.e, towns and villages. Furthermore, their population density in these enclaves are exceedingly high, Arabs versus Jewish citizens. When Israel turned over Hebron to the Palestinians, the local paper said that there were 40,000 Palestinians but less than 500 Jews. The Oslo Peace Accords simply legalized and formalized this Arab tendency to live segregated from the Jews which the Arabs wanted to do anyway because of their unremitting hatred for the Jew. This voluntary segregation makes it very easy for a military planner if he has been given the task of annihilating an entire population, and that is what Obadiah 15-18 is prophesying. The last precaution Israel would take before destroying these Palestinian villages and towns is to remove their own people. They would ensure that all Jews had been removed from harm's way. As we stated, above, such removal of the Jews from harm's way would constitute a final sign that such hostilities were about to begin. If I were still in U.S. Army Intelligence, and saw the IDF [Israeli Defense Force] physically separating Arab towns and villages and sealing off roads to prevent Jewish citizens from travelling to and from such settlements, I would immediately call my superior officer, at home if necessary, and in the middle of the night! This development is what we called a "War Immediacy". 1. "Wallerstein accused the government of keeping roads in Judea and Samaria closed to Jewish traffic for political, and not military, reasons ..." He even said that the Army would deny they had closed these roads, but that denial does not make it any the less true. Thus, Jewish citizens are not only separated from these Palestinians settlements, they are also prohibited from going there while the roads are closed. This will prevent Jewish citizens from being accidentally caught in harm's way when the bombs, quite possibly Fuel-Air bombs, begin to fall. "Can you see how easily a military commander armed with sophisticated Fuel-Air bombs could annihilate every Palestinian living within these enclaves? The key to watch is the "physical separation" the IDF was ordered to carry out in November 2000. If this separation includes the forcible evacuation of Jewish citizens living within the Arab enclave, you can know this prophesied annihilation is about to begin. " We can say with certainty that this type of extreme "physical separation" of Palestinian settlements makes no sense at all under normal circumstances. This action will ruin the local economy. Further, sooner or later, international news will become aware that the IDF is imprisoning 3,000,000 Palestinians in their own settlements, and the outrage will be extremely high. Therefore, whatever plan the military has for sealing off these settlements has got to be short-term, not long-term. 3. Lastly, Wallerstein said, "... many similar roads, such as the Trans-Judea highway, continue to be closed, and that there is no access to northern Jerusalem and the Atarot airport, etc." Thus, we have the confirmation that the IDF is taking this type of "physical separation" of Palestinians from Jewish citizens all throughout Israel. Prime Minister Barak has ordered the IDF to complete their "physical separation" plans by November 15, which not so coincidentally is the same day Arafat says he is going to announce Palestinian Statehood. This announcement is certain to trigger war, all-out war. Unfortunately, I believe we are about to see Obadiah 15-18 fulfilled in our Daily News. But, this war is simply the trigger for the Masonic planned Third World War that has been designed since 1870 to produce Antichrist [Read NEWS1056 for full details of this plan]. This announcement by Sharon may mean that the final stages of building these "physical separations" is close at hand. His announcement certainly does not mean that Israel is going to start physical separation plans, for she has been working toward this goal for 16 months. Many Palestinians have complained over the past 17 months that they feel like their beloved homes and villages have been turned into jails. Further, this "physical separation" has hastened the economic collapse now evident all throughout the Palestinian economy. United Nations Secretary General also felt this announcement by Sharon represented a very grave development. 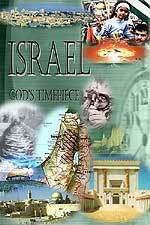 Pray for the peace of Jerusalem [Psalm 122:6] and for the protection of Israel [Daniel 12:1]. And, pray that God's glory will be manifested as He begins to fulfill His End Time prophecies [Isaiah 34:16]. Truly, the End of the Age seems upon us.